The Agriculture Department will not have to furlough any of its employees in fiscal 2013 because of budget cuts. Congressional appropriators have approved the department’s request to shift funds within the Rural Development division to avoid furloughing about 4,800 employees because of sequestration, according to House and Senate aides. Lawmakers had until Thursday to respond to Agriculture Secretary Tom Vilsack’s April 23 request to use special limited budget flexibility -- what’s known as interchange transfer authority -- to cover salary shortfalls in Rural Development in fiscal 2013. That means the department’s roughly 94,000 employees are off the hook in fiscal 2013. Furloughs are not on the table for any other Agriculture agencies this fiscal year. Agriculture is one of a few departments that have interchange transfer authority, “which allows for transfers of up to 7 percent among certain accounts within an individual USDA agency,” said Michael Young, the department’s director of budget and analysis, in March congressional testimony. 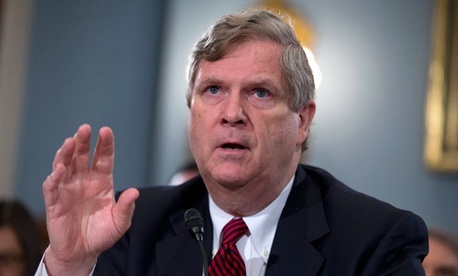 Vilsack in April told House appropriators that employees at the Farm Service Agency and Rural Development could be forced to take up to 10 furlough days because of a 2.5 percent cut to Agriculture’s budget -- on top of sequestration -- in the fiscal 2013 continuing resolution enacted in March. The department was able to avert furloughs at FSA, which has 11,928 employees, by freezing hiring, cutting discretionary operating and contract expenses, and transferring unused funds from a conservation program to cover salaries. Meat inspectors at Agriculture’s Food Safety and Inspection Service also avoided furloughs this fiscal year when Congress added funds to the CR. The efforts to avoid furloughs at Agriculture, as well as at the Federal Aviation Administration, Education and Justice departments, and other agencies reinforce the conventional political wisdom that Congress could be content to scale back the sequester in a piecemeal fashion, based on pressure from the public, or powerful interest groups, rather than in one fell swoop. Rep. Chris Van Hollen, D-Md., introduced legislation on Monday that would replace the mandatory across-the-board budget cuts through fiscal 2014. Van Hollen, who is ranking member of the Budget Committee, has introduced similar bills unsuccessfully during the last few months.